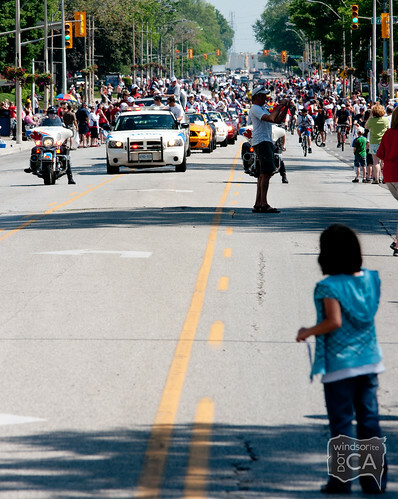 “In the rest of Ontario, it’s Victoria Day. In Windsor, it’s Victorious Day!” said @barilko on twitter. And it’s true. 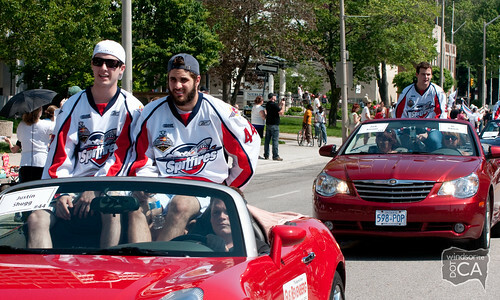 Windsorites celebrated like never before in the streets of downtown this afternoon, when our hometown heroes — the Windsor Spitfires — returned from their week-long battle for victory at the Memorial Cup in Brandon, Manitoba. 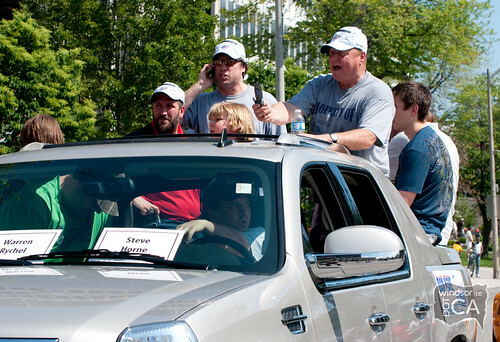 Despite parade delays due to the Spitfires’ charter plane leaving Winnipeg later than expected, hundreds of fans were at the airport to cheer on the players and coaching staff, and thousands more waited under the warm sun in hopeful expectancy to catch a glimpse of their favourite team members as the parade began at Giles and Ouellette. One-by-one, the men who put Windsor’s name on the national map, descended on Downtown with trophies and commemorative hats marking our city’s name as Canadian champions! Bob Boughner and Windsor Spitfires’ coaching staff. Warren Rychel and other members of the Front Office. Star players Harry Young and Ryan Ellis carry the prize: the Memorial Cup. Assistant Captain Greg Nemisz and Taylor Hall, carrying the Stafford Smythe Memorial Trophy for Most Valuable Player. Dale Mitchell carries the J. Ross Robertson Cup, won earlier this month. Justin Shugg, Mitch Dunning and Zack Kassian. The Spitfires decended Ouellette to Dieppe Park to take part in celebrations.